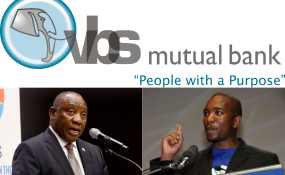 DA MP Ghaleb Cachalia has apologised to EFF leader Julius Malema for his tweet claiming Malema owned 47% of Dyambeu Investments, which is linked to VBS Mutual Bank. The EFF said in a statement on Sunday that Cachalia withdrew his allegations "which were posted as fact" upon a letter threatening to take legal action against his "defamatory, false and deceptive allegations". "This is proof of a well-orchestrated propaganda campaign to discredit and tarnish the good and reputable name of the EFF," the party said. In a letter dated October 13, which the EFF tweeted, Cachalia admitted that he was unable to verify the allegations that Malema owned 47% of Dyambeu Investments. Cachalia said in the letter to Malema and the EFF's lawyers (KMNS INC) that he deleted the tweet that he posted on October 12 immediately upon realising that he was unable to verify the information. "I apologise unreservedly for any inconvenience the tweet may have caused your client. I have also tweeted a retraction ... which reads: "After reviewing the sources to my information leading me to tweet regarding Mr Malema on 12 October 2018, I am unable to verify my allegation that Mr Malema owns 47% of shares in Dyambeu investments. Accordingly, I immediately removed the tweet alleging shareholding, and unreservedly apologise for any inconvenience this may have caused any party so implicated." The EFF said they were not only unshaken but remained focused and strong "in the face of all these weapons of mass deception".